Abuja Creative Summit is a program designed to bring together all the key stakeholders of the Abuja entrepreneurial, innovation and creative ecosystem; international organizations, the government, investors, innovators and creatives. 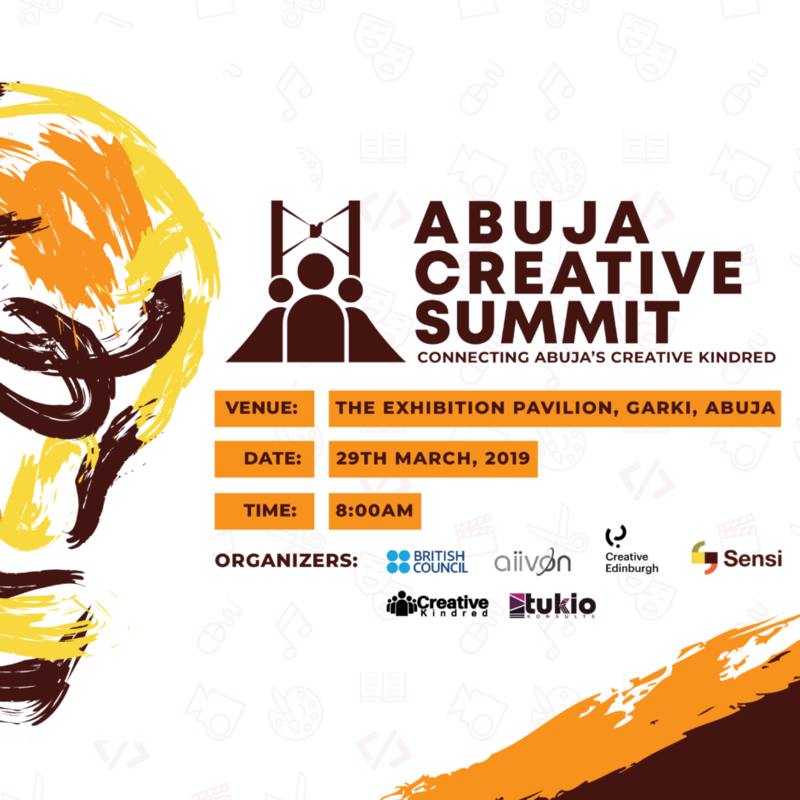 Abuja Creative Summit is slated to take place in the 29th of March 2019 at The Exhibition Pavilion, Abuja. It will be a 1 day event and number of expected participants is 500. 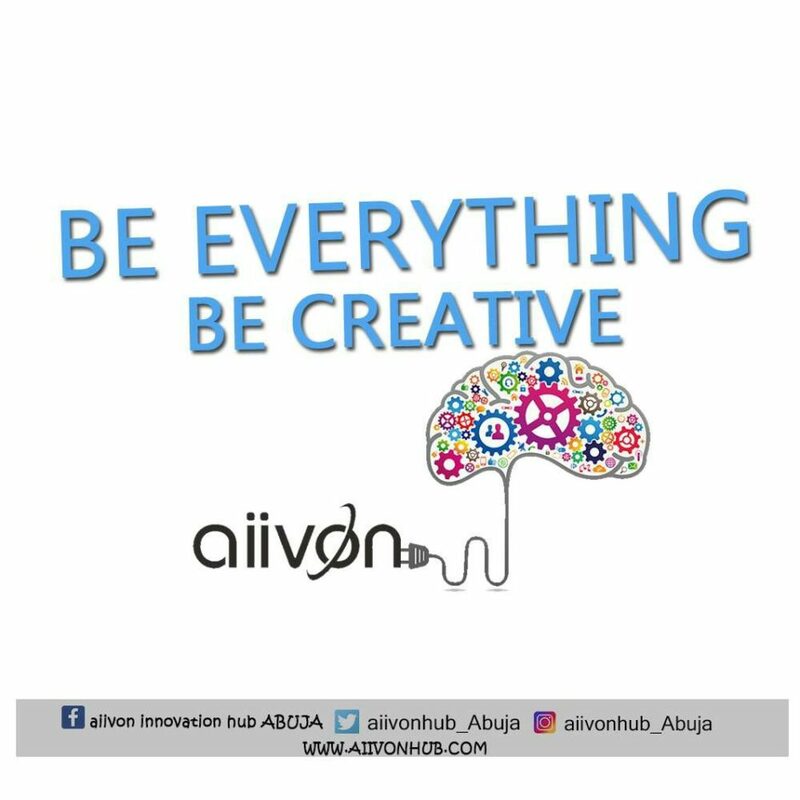 Aiivon Innovation Hub is working in partnership with the British Council, Creative Edinburgh, Scotland, and Sensi Hub, Sierra Leone to create this platform for stakeholders to network, dialogue and learn from each other. During the summit, an online platform called Creative Kindred (building on the success of a similar model by Creative Edinburgh in Scotland) will be launched. It’s a digital community created to bridge the gap between creatives in Nigeria, Sierra Leone, and the UK and to create additional income, exposure, cultural exchange, and networking opportunities for creatives in Abuja and eventually across Nigeria. Creatives across different sectors like; Interior designers, web developers and programmers (UI designers), architects, graphic designers, video and sound editors, animators, fashion designer/illustrators, creative and art directors, photographers, video editors, music artists, spoken word artists, music producers, actors, directors, writers and content developers, visual artists, makeup artists etc. will be able to register on the platform. The Creative Kindred platform will be a one stop shop for anyone looking to put together a creative team for almost any type of project. The purpose of the Summit is to not only unveil the Kindred Platform but also to engage with the creative community in Abuja and have conversations about challenges, opportunities and progress being made in the space. There will be panel discussions, break out sessions (workshops on different topics to empower creatives), art and fashion exhibitions and many more interesting activities. Ecosystem partners will also have a chance to curate sessions, leverage on the event to drive their agenda and network with other stakeholders. With the constant and consistent evolution in technology, we have identified the need to invest in the younger generation and empower them with skills needed for the 21st century. In a world totally driven by ICT, It’s never too early to harness the wide imaginations and creativity in the minds of these young ones. It is rather wise to teach them that these tools being invented each day can do much more than just streaming videos and going through people’s status on social media. It’s our goal that beyond the class room, students would learn the practical steps to web design and web development, graphics design and photo editing, game design and animation, mobile app development etc. through our summer camp. The summer camp this year would take place in Abuja and UCLA University, California USA. This main idea behind the summer camp is to introduce children aged 7-18 years to an in-depth knowledge to ICT and programming; to nurture and prepare the younger generation for the worldwide tech revolution in a fun, interactive and creative way. Each lesson is purely practical, interactive and comes with unique projects for kids to work on. Using familiar concepts and objects, kids learn to reproduce the applications they use every day. This summer camp is designed to help them express their creativity in new, fun ways! Our team of experienced facilitators would be on ground to ensure that the kids have an optimal experience in the summer camp. You can avail your kids this opportunity by calling 08077452890. It can be said that ICT is a pertinent component of an educational system. Therefore, a our dynamic devilment methodology, Aiivon has identified the need to invest in the younger generation and position students for success in the word of innovation and technology, as well as providing them with real world technology experience. 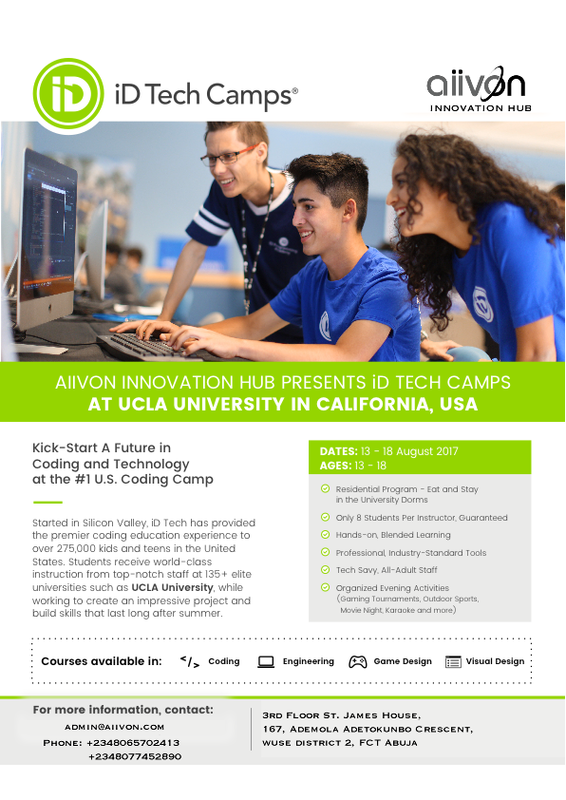 In order to enhance and encourage curiosity and enthusiasm for technology, Aiivon is set to introduce and pioneer Tech Clubs in primary and Secondary school respectively. The Tech Cub is designed to educate and properly train the next generation of technology leaders in Africa and the world at large. Students will be given the opportunity to creatively express themselves in a safe environment. Tackling challenges using tech techniques and tools; students will be able develop worth-while skills such as problem solving, creativity, collaborative teamwork, take up new challenges, meeting deadlines, build and create products by themselves. Students will be taught mobile application development, game design and animation, Robotics, cyber security, 3D modeling and printing, web design and much more. This interactive and hands-on program is aimed at enriching the knowledge of children between ages 7-18. The program will be 80% practical and students will move from beginners’ level unto advance level. At the end of the session, outstanding students from various schools will participate in the inter-school Tech competition and other competitions. They will also be exposed to the wider world of IT through our Tech clubs. Applications are pouring in for Disrupt SF’s Startup Battlefield competition, and it’s no wonder — this year’s Startup Battlefield participants will join an illustrious alumni network of 655 companies (like Cloudflare, Dropbox, Trello) that have raised more than $6.9 billion in funding and have excited or IPO’ed more than 95 times. We are still searching for innovative startups that want to launch on our stage and aren’t afraid to get a little competitive! 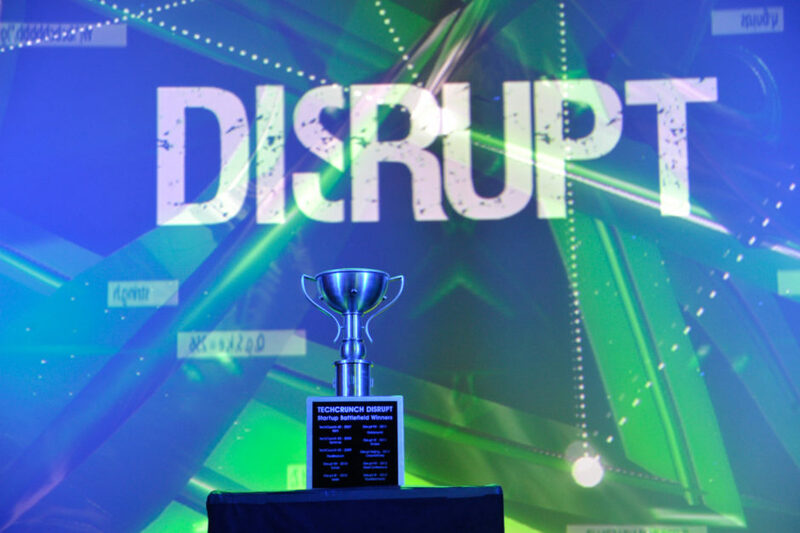 The winning company takes home the legendary Disrupt Cup and an equity-free check for $50,000 — not to mention a place in the startup history books. Around 25 startups will be chosen to pitch for six minutes on the Disrupt SF stage in front of thousands of attendees and millions of online viewers. Each company will pitch with a live product demo, followed by Q&A from a panel of top-tier judges. Past judges include big names like Susan Lyne (BBG Ventures), Roelof Botha (Sequoia Capital) and Fred Wilson (Union Square Ventures), just to name a few. Applications close July 15th at 12pm PT and all companies must apply through our application page. You can find our complete eligibility rules here, but the basics are that it is open to any company from around the world in any vertical that has not received much press exposure. Preference will be given to companies launching on the Disrupt stage for the very first time, so if you think your startup fits the bill — apply today! In the first round, entrepreneurs have to pitch their idea in 25 words or less. Bonnici expects at least 25,000 entrants to the contest. Initially, Bonnici’s team plans to to narrow those down to those with the 1,000 best ideas. After vetting those candidates to make sure they are qualified for the contest and have followed the rules, the marketing company plans to have a panel of CEOs evaluate the remaining proposals. Those executives, which will include leaders from Netflix and the Harvard Business School, will work with HubSpot to choose a final winner sometime around mid-August. This isn’t the first time HubSpot has put money into a startup. In May, the company invested in both the account-based marketing firm Terminus and the B2B sales platform PandaDoc. As you might expect, HubSpot’s contest isn’t entirely altruistic. The company specializes in “inbound marketing,” which seeks to encourage consumers to find out information about a company and its products on their own rather than giving them a hard sell. The contest itself is an example of inbound marketing, and in this case, it’s promoting HubSpot itself. This 13-Year-Old Just Built a 6-Figure Business Online. What’s Your Excuse? Morris Laloshi is putting all those negative millennial stereotypes to shame. 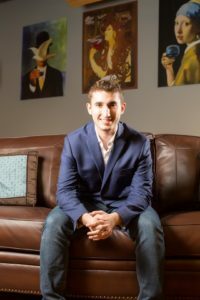 At the ripe old age of 20, he’s spent the past seven years running his own business – SEO Guys Inc. – generating six figures in revenue and serving clients all over the United States. And the lessons he’s learned are ones anyone (not just millennials) can utilize in building a business in the 21st century. Laloshi’s family would embark on an odyssey that covered five different countries and 13 different states before finally settling in Fort Lauderdale, Florida. Laloshi went on Google and began researching how to drive traffic to his father’s website. He soon discovered the importance (and power) of Search Engine Optimization, or SEO. Laloshi began helping others he came across with their websites, providing free SEO services. Eventually, someone told Laloshi he’d happily pay him $500 to do SEO for a website of his, and a business (SEO Guys Inc.) was born. While he’d put in the time and effort to learn a skill (SEO), apply it and generate great results for others, Laloshi, still just a teenager, had no idea how to actually build a business. He started with his father, who had owned and run several businesses, and then branched out, eventually finding a full-time business coach, along with going through sales training programs from Grant Cardone and others. Now, at age 20, Laloshi provides SEO for Fort Lauderdale-based businesses, along with other clients all over the United States. But building a six-figure business didn’t happen overnight, and it didn’t happen by accident. “I started out with one client, and then I tried to turn that into two,” Laloshi says. “I started out cold calling – 80, 100, 150 calls every day. “And it was very, very rough at first because with SEO … well, if people don’t know, SEO is an investment that takes at least six months to start up and start working. So in the meantime, I had to be generating revenue. I had to be generating meetings and finding clients. “So I just picked the phone and started calling, calling, calling, emailing, doing meet-ups, just everything and anything. And it worked. Laloshi credits both his upbringing and family’s work ethic along with an “old school” approach (he still puts his direct phone number on the front page of his website) as two big reasons he’s had so much success. “People always ask me, how can you be so dialed in when you’re only 20 years old?” he says. “Why am I not just out there playing Xbox with my friends? The reason is simple – my family. If you want to be successful in building a business, no matter what age or stage of life you’re in, Laloshi says you must do one thing above all others. Working hard, finding mentors and refusing to believe anyone owes him a thing. At age 20, Morris Laloshi is definitely not doing the “lazy millennial” stereotype any favors.